On the first Saturday night in September 1940, London had its first “Night Blitz.” The next day, Sunday afternoon, I was paying my visit to Westminster Abbey. Workmen were sweeping up glass near the clerestory windows and some fluttered down and landed on the Tomb of Unknown Warrior. I picked up one fragment and said Captain Clark Wallace who was with me, “I would like to start a collection of broken glass.” I thought it would be well to put together fragments which I could collect from many places. Years after, these came into being, in sanctuary that had yet to be constructed, in Calvary Baptist Church. Your vantage as you look through this window is presumed to be in a church where the windows have been destroyed. In the five lower section on each side you will observe fragments of glass which come to a point in a Gothic frame. Through the left panel you observe Chichester Cathedral in southern England near which the Canadian Army was stationed between 1939 and 1945. 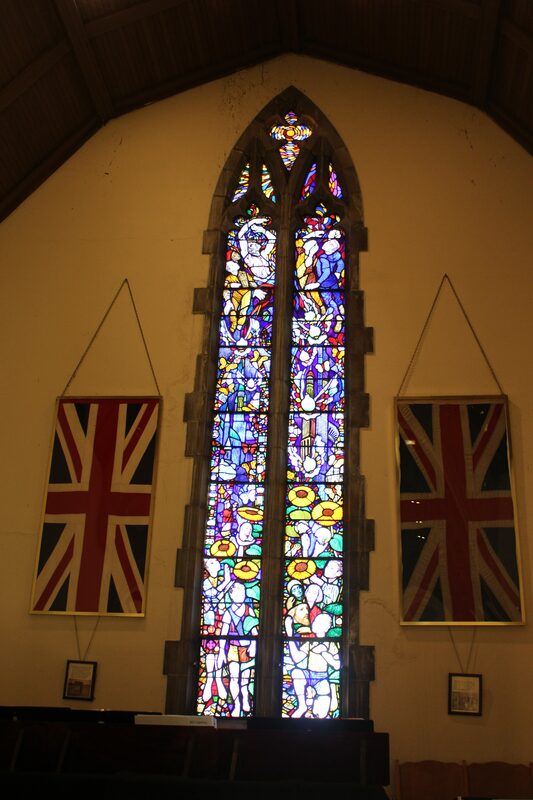 Through the right window there is the outline of the Martinikirk in Groningan Holland where I conducted a Thanksgiving Service for 5th Canadian Armoured Division the Sunday following VE Day. The top two sections of these windows have figure wearing uniforms and surmounting them is the figure of Christ. In the mullion at the top there is a beautiful swirl of glass with a modernistic touch and this centres on a circle representing the source of light. Ernst Taylor, the artist, has placed most of the historic fragments around the edges of the window to be a realistic part of the pictures in these windows. He has pained six large and bright sunflowers here to give brightness and color and depth, but also to suggest that they are looking up toward the light. The butterflies suggest the matter of air and flight created by these insects. The seven doves suggest the motion of flight and, of course, symbolize peace. The uniformed figures represent “the flight to Glory” of those who have died sacrificially.